Each year (since 2008) organizer Zavod Big hosts an architecture conference that aims to bring together exceptional architectural practitioners and thinkers to present their work, views and vision around a timely theme of particular relevance and importance. This year the theme is Pushing the Boundaries of Wood. This year the conference will explore the potentials of wooden architecture as a tool for innovative and sustainable future construction development. It aims to present positive examples of overcoming the impossible, of constructing multi‐storey wooden buildings and pushing the boundaries of wooden constructions. In this lecture Anssi Lassila will focus on presenting the Puukuokka Apartment Block as an example of housing in wood on a large scale. Anssi Lassila will give a talk at Aalto University in Helsinki today at 14.00. The event is part of the Contemporary Finnish Architecture course. Anssi Lassila of OOPEAA will give a talk in the 57°10 architecture lecture series at the Scott Sutherland School of Architecture and Built Environment in Aberdeen, Scotland. In his lecture, Anssi Lassila will discuss the role of a collaborative design process and an active engagement with skillful craftsmanship in creating architecture. 57°10 is an architecture society with a mission of inspiring students and future architects by exposing them to topics beyond the discourse of the school. The society, 57°10, has been running for 27 years and invites guest lecturers to the school to talk about the ideas and projects explored by their practices. Some of the previous guests include renowned architects such as Andreas Deplazes, Snøhetta and Zaha Hadid. This season the speakers include Mauricio Pezo and Sofia von Ellrichshausen of Pezo von Ellrichshausen and Reiulf Ramstad, among others. Four projects by OOPEAA have been selected to be presented in the exhibition “In Therapy” in the Nordic Pavilion at the architecture biennale in Venice 2016. Puukuokka will be featured as one of the nine projects to be highlighted as uniquely representative of the contemporary Nordic scene. In addition, House Riihi, Sauna Tonttu and the Kuokkala Church will be presented in the exhibition as part of the survey of contemporary Nordic architecture. In Therapy: Nordic Countries Face to Face is curated by David Basulto of ArchDaily with James Taylor-Foster as assistant curator. It relates to Alejandro Aravena’s overall theme of the 2016 Venice Biennale “Reporting From the Front”, focusing on specific challenges being faced in the Nordic region. The exhibition uses the structure of Abraham Maslow’s 1954 ‘Hierarchy of Needs’ as an analytical lens and an observational springboard from which to explore and investigate architectural projects that have been instrumental in constructing contemporary Nordic society. The projects to be included in the exhibition were selected on the basis of their contribution to the current condition of Nordic society. The Nordic participation at the Venice biennale is a collaboration between the Museum of Finnish Architecture, Helsinki, the National Museum’s Department of Architecture, Oslo, and ArkDes – the Swedish Centre for Architecture and Design, Stockholm. Puukuokka (2016) will be examined in depth as an example of Finnish architecture in the category Foundational, which focuses on architecture that cares for basic needs, encompassing (but not limited to) shelter, healthcare, and educational facilities. House Riihi (2014) will be presented as one of the projects in the larger survey of contemporary Nordic architecture in the category Foundational. Kuokkala Church (2010) is included in the category Belonging, which highlights architecture that enacts public programs and creates public space in which society gathers; the places where individuals become citizens and relate to one another. This includes (but is not limited to) sacred spaces, civic (institutional, cultural and recreational), workplace (office and retail), and infrastructural projects. Sauna Tonttu (2010) will be presented in the category Recognition, which showcases architecture that recognizes and reflects upon certain processes in Nordic society, and its values. As the embodiment of a highly developed nation, projects that fall into this category have a reflective position on society and highlight its latent values (including but not limited to monuments, memorials, and projects which engage with the natural landscape). The countdown clock for the Lahti World Championships in Nordic Skiing in 2017 was officially started on February 19, 2016. The countdown clock for the Lahti World Championships in Nordic Skiing has been designed by Anssi Lassila / OOPEAA. The clock is counting down time to the championships starting in February next year. Environmental responsibility is a core value for Lahti in hosting the championships. Responding to that theme the clock is made of cross laminated timber, CLT, produced with local materials. It has been realized in collaboration with Stora Enso, the lead sponsor of the championships, who has provided the material for the clock, and built by students at the Lahti University of Applied Sciences and at the Salpaus Further Education. Puukuokka by OOPEAA has been chosen as one of the nine highlighted projects to represent Finnish, Norwegian and Swedish architecture at the Venice Biennale in 2016. David Basulto, curator of In Therapy: Nordic Countries Face to Face – the exhibition at the Nordic Pavilion at the Venice Biennale in 2016 — has announced that 500 submissions were received following an Open Call. Of these, 300 projects have been selected to form a contemporary survey of Nordic architecture and will form the central body of the show. Nine have been chosen as uniquely representative of the contemporary Nordic scene and will be presented in depth. 2016 La Biennale di Venezia is curated by Chilean architect Alejandro Aravena. The theme of the Biennale is “Reporting from the Front”. The Biennale is open to the public 28.5.– 27.11.2016. We are excited to announce that Puukuokka Housing Block is one of the five finalists in housing category for the ArchDaily Building of the Year Award 2016! Puukuokka was selected from over 3 000 projects. Over 18,000 architects and enthusiasts participated in the nomination process, choosing projects that exemplify what it means to push architecture forward and capture architecture’s capacity to spark positive change in the environment. These finalists are the buildings that have most inspired ArchDaily readers. You can find more info and vote for Puukuokka here. You can vote until February 8th, 2016 at 11:59PM EST. Go vote for Puukuokka now! On February 4th, 2016 at 10.35 Anssi Lassila will give a lecture at the „SUPERWOOD” congress at Architekturforum DACH+HOLZ INTERNATIONAL 2016 Stuttgart, Germany. In this talk Anssi Lassila will focus on presenting the Puukuokka Apartment Block as an example of housing in wood on a large scale. He will address the question of scale from several different points of view. Using various projects executed in wood by his office OOPEAA, he will illustrate how the dimension of scale, of small and large, manifests itself in architecture. On the one hand, it is about a journey of exploration and discovery that starts with the big picture and finds its expression on the level of the smallest of details. On the other hand, it may also start with the very tangible qualities of the chosen material and grow from there into a full-blown project. In this way, the process of creating architecture is always about a dialogue between the small and the large, about interaction between different forces at different levels of scale. Projects submitted to this year’s awards program reaffirm the versatility of wood within construction by presenting projects that push the boundaries of applications for wood products. Both the International and North American projects displayed a well-articulated understanding of old and new techniques for wood in architecture. “The Wood Design Awards program is an opportunity for design teams to showcase their exceptional wood buildings and construction techniques, and to highlight examples of applications for wood/wood products that can be applied to different projects and under varying conditions.” notes Etienne Lalonde, Vice-President of Market Development for the Canadian Wood Council. Awards were given in three categories: Honor, Merit and Citation. In addition, special awards were granted by the Canadian Wood Council as well as this year’s sponsors, Sustainable Forestry Initiative and Western Red Cedar. For a full list of the award recipients and the press release by the Wood Design & Building Magazine, click here. 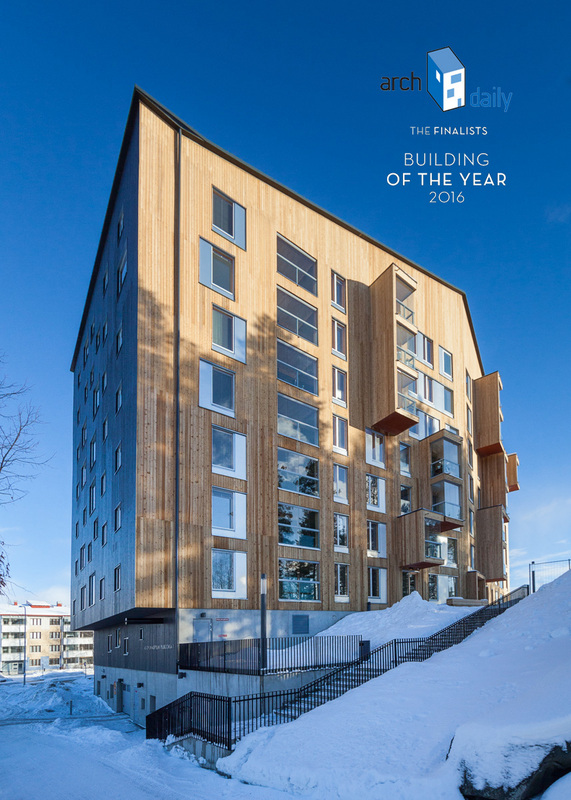 Completed in November 2014, Puukuokka is the first eight-story high wooden apartment building in Finland. It explores the potential of modular prefabricated CLT construction to meet the goal of providing high quality, environmentally responsible and affordable housing. Commissioned and built by Lakea, it is an energy-efficient and ecological trio of multi-story wood-framed apartment buildings in the Jyväskylä suburb of Kuokkala. The entire load bearing structure and frame is made of massive wood and composed of prefabricated volumetric CLT modules. Also the facade elements that are prepared separately and brought to site ready for assembly are entirely of wood. Spruce has been used in the facades facing the street, and untreated larch had been used in the interior courtyard side. The spruce has been treated with a coat of dark paint and the latch in the interior courtyard will turn silvery grey over time. The town plan created in collaboration with the City of Jyväskylä has been tailored to meet the needs of the building complex. Puukuokka pilots an innovative lease-to-own financing strategy that aims to support social sustainability by promoting stable communities. In Puukuokka, the goal was to find a solution that makes the best possible use of the technical and aesthetic qualities of CLT and to create a wooden building in large scale with a distinct architectonic expression of its own. 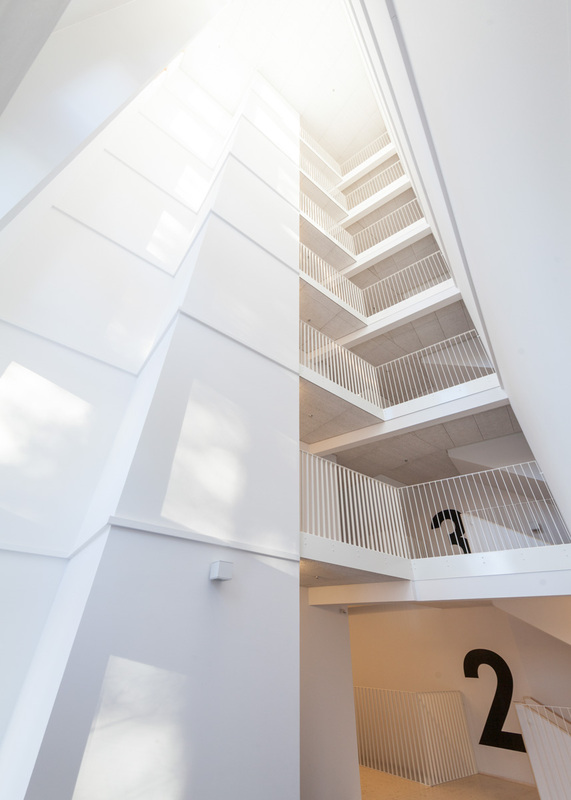 The goal was to create a building that combines the sense of privacy of a single-family dwelling with the semi-public character of the shared spaces of an apartment building. The vision is to provide the residents with a functional space rich in experiential qualities. 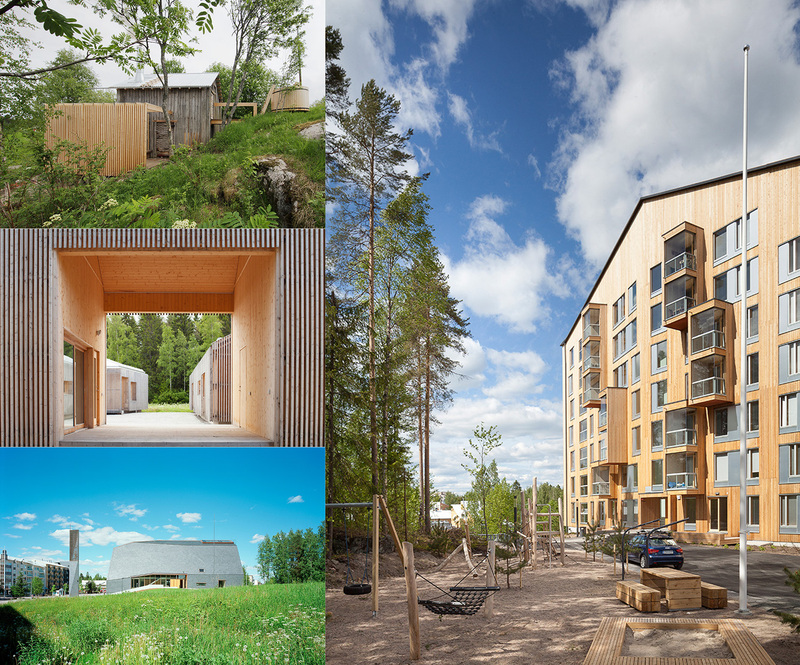 Puukuokka served as a pilot case to develop and test a CLT based system of volumetric modules. 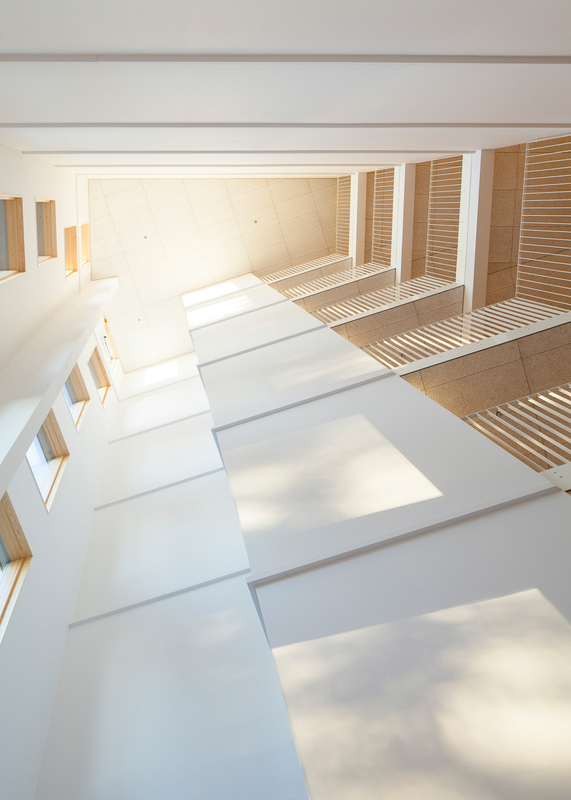 Working with CLT enabled several important aspects in the project: The use of CLT made it possible to create a spacious hallway and atrium space with a lot of light realized in an energy efficient manner as a semi-warm space. Thanks to the insulating qualities of massive wood, the use of CLT allows for controlling the temperature of the individual apartments independently from that of the hallway space. In addition, the use of prefabricated volumetric CLT modules made it possible to integrate the piping for heat, water, electricity and ventilation in the wall structure in the hallway allowing for an efficient organization of the plan and making it possible to maximize the space allotted for each apartment. The prefabricated modules are made of spruce. Each apartment is composed of two modules, one housing the living room, the balcony and the bedroom, the other housing the bathroom, the kitchen and the foyer area. The use of prefabricated modules made it possible to cut the construction time on site down to six months and to reduce the exposure to weather conditions. That made it possible to achieve a higher quality in the end result. Working with CLT also made it possible to create a building with a primary load bearing structure and frame fully made of wood. The CLT modules are prefabricated in a local factory in Hartola less than two hours away from the site of Puukuokka. On January 12, 2016 at 6 pm Anssi Lassila will give a lecture at the Boston Architectural College, Cascieri Hall. The title of the lecture is “Of Things Small and Large”. In this talk Anssi Lassila will address the question of scale from several different points of view. Using various projects executed in wood by OOPEAA, he will illustrate how the dimension of scale, of small and large, manifests itself in architecture.